Many thanks for taking the trouble to comment on last week's post. It was very reassuring to get a few opinions and I hope I've taken some of these on board (I didn't even know what "Word verification" was beforehand!) with the changes I've made. It’s easy to pick on Lehmann, after two such significant, successive bloomers and believe me, I’ve never been our loony net minder’s no.1 fan. For some time now I’ve believed that our bantamweight backline might be best served by a keeper who’s more capable of dominating his box. Yet at least Jens mistakes were honest ones. He fell over against Fulham and took his eye off the ball at Blackburn. It’s just that keeper errors tend to be more crucial and we need to bear in mind that our goal and Bendtner’s chance late-on, both stemmed from a strangely inconsistent showing from Brad Friedel at the other end. I know it might be sacrilege to criticize our Spanish starlet and at first I thought it strange that our most influential midfielder was already looking just a little jaded, ever since I first saw him in pre-season. But after studying Sunday’s highlights, I’m half wondering whether success might have gone to Fab’s head. Or perhaps it’s merely the negative effect of having the substantial egos of those such as Billy Big Bollix Bendtner about him in the Arsenal camp. Whatever the cause, it seems to me that Cesc urgently needs taking to task, to remind our wunderkid of his responsibilities. All that amazing ability ain’t worth a jot, without a work ethic to go with it. For all we know, Fab might be strictly adhering to Arsène’s instructions. Yet from his flat-footed body language, one could quite easily construe that Fab believes he’s beyond all that industrial donkey-work, all too often leaving our very own water-carrier, Flamini, outnumbered in front of the back four. The most positive aspect to a highly competitive encounter at Ewood Park was that Wenger’s vertically challenged squad probably would’ve been outmuscled by Rovers in the past and perhaps intimidated out of our hard won point. However I fear for Van Persie when the red mist comes down. I’m far from convinced he’s suited to a lone striker role. Aside from his tendency to lose his patience, it appears to be a waste of Robin’s prodigious talent, to have him expending all his energy, often leaping in vain for Lehmann’s long punts.. Moreover, watching the TV replay, it didn’t take a lip-reader to realise Mark Hughes’ side did a successful job on him. So long as the Dutchman was haring around, intent on reaping revenge on his tormentors with his studs, our hot-headed striker wasn’t sufficiently focused on letting his talent do the talking and doing damage where it really hurts. You could sense the mood of frustration amongst the travelling Gooners, at having thrown away 3 points, on the long uphill trek back to the car, facing a 3/4 hour schlep home, amidst mid-August’s miserably wet, positively winter-like weather. Based on the stats, a draw looks like a fair result, but our single point felt like scant reward for our long trip North and a squad full of bruised limbs. Especially when Rob Stiles incompetent efforts at Anfield only served to reinforce the feeling that we’d wasted a rare opportunity to gain ground on all our main rivals. In truth our result against Rovers will only truly be measured in terms of how the other top clubs fare, when they travel to Ewood Park. An astute Mark Hughes might’ve amassed a squad that’s capable of giving all-comers a run for their money, but why will I not be surprised if Rovers are not nearly so fired up, to rough up the likes of Liverpool, Chelsea and Man Utd? Timing is a crucial factor nowadays. We were unfortunate to be facing a Blackburn side determined to “set its stall out” in their first home game. It remains to be seen whether Benitez’s summer buys are capable of giving Liverpool that 20-plus goal a season leg-up, to finally mount a consistent title challenge. On first impressions, Torres and Babbel certainly look likely candidates. But unless Chelsea arrive at Ewood Park during the African Nations, depleted of Drogba and co. its hard to imagine them dropping points. I thought I was going to have to make Sunday’s trip on my tod. If that had been the case and if there’d been live TV coverage of our game, I might’ve been sorely tempted to stop at home, to enjoy all three encounters on the box. But mercifully my good mate Steve came up trumps with an offer of a lift that meant I only had to drive the first 50 miles to Oxford, to meet up with him and his lad Charlie. Besides, I couldn’t possibly blow this outing out, as bizarrely we now remain in London for our next six league games, until our trip to Anfield, right at the end of October. And I had to pay penance for an act of treason the previous day, when I foolishly accepted an invitation to watch Tottenham v Derby at White Hart Lane. After their woeful start, I wondered if my Spurs pals had conspired to phone me, in the hope that I might prove their lucky mascot, as I witnessed Spurs put five past Charlton the last time I accompanied them down the wrong end of the Seven Sisters Road. Keep it under your hat, as I don’t want to end up being lynched by my disgruntled Gooner mates, who up until Saturday had been “giving it large” to all the Spurs fans, with their premature proclaimations that this was to be their season. But if it’s a crime to enjoy watching live footie, I’m undoubtedly guilty as charged. So why would I want to stop at home with the oohs and aahs of the more passionate pundits on Sky’s Soccer Saturday, when I could be watching in person, a Premiership game on my doorstep. Again Spurs probably benefited by playing a promoted side so early on and being able to demolish all Derby’s illusions, with this “welcome to the Premiership” wake-up call. Heaven only knows how Pompey dropped points against these Black Country lightweights, as until the team that Billy Davies put out on Saturday receives a much needed quality boost, they must be the most obvious relegation fodder. I’m told that the likes of Huddlestone and Jenas all too often fail to impose themselves against decent opposition but their entertaining promptings deserved my begrudging applause on Saturday, with Huddlestone producing some positively Hoddle like touches with his long-range passing. To my mind he and Micah Richards are amongst a rich seam of highly promising young British talent and I only wish we had a couple of them at Highbury…sorry, force of habit! We might have Theo Walcott, but if Wenger is not careful, he risks our crowd rapidly losing patience with Theo, as a result of his continued efforts to convert him into a winger. Watching Wrighty’s stepson producing a constant supply of ammo for Chelsea’s strikers, with his sumptuous crossing, I was reminded of how long it’s taken for SWP to live up to all the expectation on his young shoulders. And he’s a natural winger, whereas Walcott’s striking instincts tend to take him towards goal. Talking of which, without Ronaldo streaking down the wing, Man Utd did a passable impersonation of the Arsenal on Sunday, with their efforts to pass their way through the heart of City’s formidable centre-back partnership. At present, the only threat of any width from the Arsenal is provided by the increasingly impressive performances of our full-backs, Clichy and Sagna, who are both proving their ability at both ends of the pitch, along with the 90-minute engines necessary for their lung-busting efforts. However I couldn’t watch Sunday’s matches without wondering how much better off we might be, if we still had Pennant and Bentley whipping in balls from out wide. It will be ironic if Arsène is forced to purchase a natural winger, after passing on the potential of our own homegrown talent (although Pennant originally arrived from Notts County). By contrast I am sure we’d show a net profit, if Arsène chose to buy back Anelka. I certainly wouldn’t baulk at the addition of Le Sulk’s scintillating pace up front. Nor do I expect Aliadière’s efforts up at Boro to prove similarly embarrassing, as I believe Jeremie’s undoubted ability is far more suited to the Continent. I downloaded a moody copy of the utterly breathless movie, the Bourne Ultimatum, to watch after MOTD. I found myself wincing at many of the full-blooded tackles from Blackburn on Sunday, just as I did with some of Matt Damon’s fantastic stunts in the flick. The difference being that the Hollywood star has a body-double to dive through plate-glass windows, whereas the Gunners have no such luxury when being slammed by the likes of Nielsen and Samba, or when it comes to avoiding a red card reaction to the shenanigans of a slieveen like Savage. Yet like the rest of us, by now Wenger must know to expect nothing less from the vast majority our away matches. In actual fact it’s the ultimate compliment, as an admission that our opponents couldn’t possibly expect to compete in a straightforward contest of footballing skill. Agreed that Cesc should have done better in blocking the shot by Dunn, but i wont question his commitment. It was just a lapse of concentration like Lehmann had and it cant be deemed lack of commitment or forgetting about responsibilities. sorry but i do not agree with the two of you regarding cesc not doing enough. 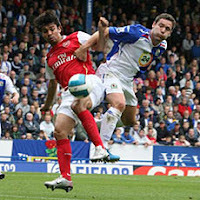 that was a quick exchange of passes between the two players, and as you know cesc isnt the fastest player in the world. even running at full speed he would not have caught up with dunn. Please know that i dont think cesc is infallible, incapable of making a mistake or not running that extra mile every once in a while, but nobody, even the most committed can do that for every second of every game. in fairness of all the players in the league, Dunn with the ball 25 yards from goal is not one who would make you quake in your boots. If you want a time i thought cesc did give up on the play blatantly, check Jenas' equalizer against us last year, in the final seconds of added time. if you were talking about that you would have had a much better case. the exact thoughts regarding pennant and bentley and walcott went thru my mind midway thru the first half. indeed im beginning to lose patience on walcott seemingly not at ease with himself. always trying hopeful crosses instead of cutting in with guts. i am damn sure he'll wreck havoc soon, but when? lets give him till his 21st birthday. Desc needs to get back to patrolling the area between the second striker and Gilberto/Flamini or whoever. This idea that he should score has taken away his creative passing from deep and also means that he is getting caught up in the rough stuff. He can fight his corner and having proved that he can I'd like to see his sitting back and passing. Let Flamini do the running forward as he's got the engine for it and is as likely [or unlikely] to score as Cesc. Cesc definitely has weaknesses as a player (fantastic as he is) and failing to track back is one of them. But to link that to lack of commitment and to suggest he is egotistical is stretching it to be honest. I can think of examples where every one of our players has failed in some defensive duty - i don't think it implies that they are big-headed and lazy. That's a big call. Besides all that, didn't Wenger say after the game in mid-week that Cesc was recovering from a virus and wasn't at full fitness? Good to see you slightly changed the color of your site. I want to blame Cesc for the goal but when all is said and done, the blame has to ultimately go to Lehman.